"On 26 April 1937, in the rubble of the bombed city of Guernica, the world�s press scrambled to submit their stories. But one journalist held back, and spent and extra day exploring the scene. His report pointed the finger at secret Nazi involvement in the devastating aerial attack. It was the lead story in both The Times and the New York Times, and became the most controversial dispatch of the Civil War�, and �(...) inspired Picasso�s black-and-white painting Guernica � the most enduring single image of the twentieth century (...). George Steer identified the aeroplanes as German. He revealed to the world the dirty secret that Nazi Germany was deeply embroiled in the Spanish Civil War, hugger-mugger with General Franco's 'insurgents'."(*). 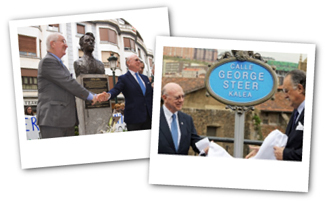 On the 26th of April 2006, the 69th Anniversary of the Bombing of Gernika, the town paid homage to George L. Steer, by erecting a bust in his honour. Today there is also a street in Bilbao that honours his name.